Metadata such as bookmarks, markers or data from third-party systems. The recorder streams and saves all signals (data) synchronously in real time. Events can be marked automatically or manually while recording is delayed or recalled as VoD. (VoD = Video on Demand). The system architecture allows system sizes from a few to hundreds of channels. The Black Box Media Recorder supports you and monitors securely. You can use the device for the transmission, recording and analysis of work processes, operations, events, training programs and monitoring measures. 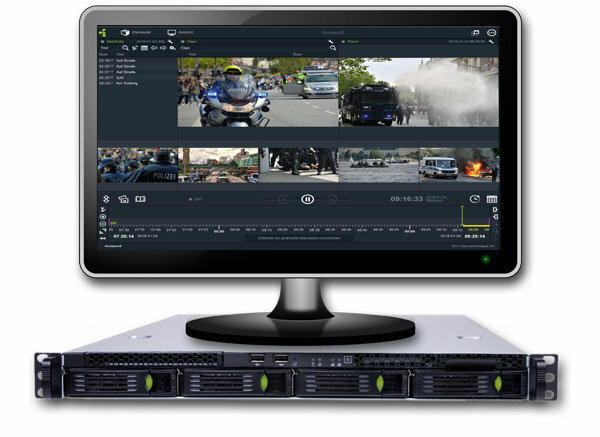 The media recorder records all audiovisual content and metadata in real time in HD video and Hi-Fi audio quality with maximum operational reliability.